ALOHA from the 2019 Regions 9 & 10 Conference Co-Chairs! Welcome to beautiful Waikīkī Beach, home of the 2019 Region 9 & 10 Conference! The conference steering committee has been working tirelessly over the past two years, pulling together the best of Regions 9 & 10 to bring this years conference to you in this idyllic setting. 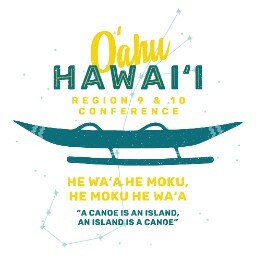 Our conference theme, He Waʻa He Moku, He Moku He Waʻa (A canoe is an Island, an Island is a canoe) is a Hawaiian proverb and is sure to be engaging and applicable to the common issues we face within our respective institutions. This proverb reminds us that the pursuit of education is a journey, and that success is dependent on our commitment to each other and to the students we serve. With Waikīkī Beach and Diamond Head as the backdrop, this venue is an important dimension of this conference. For centuries, as a stopping place of explorers, Hawaiʻi has historically been enriched by the blend of ideas that have crossed our shores. We hope that the 2019 Region 9 & 10 Super-Conference continues this tradition, encouraging you to share ideas with colleagues new and old, as you stock your canoe with the necessities to guide students on their journey. Spend some time sharing aloha with your peers from Region 9 (California, Hawaiʻi, and Nevada) and Region 10 (Arizona, Colorado, New Mexico, Utah, and Wyoming). We would like to send a huge mahalo to the conference steering committee for their roles in planning this conference. Their dedication, enthusiasm, and hard-work made this conference possible. We hope you have a wonderful conference and save a little time to soak up some sun and enjoy the beauty of the island of O'ahu.